Welcome to the DieCember® release blog hop! Have you seen the dies released by SimonSaysStamp?! Today we celebrate the DieCember® release with an inspirational blog hop and lots of giveaways. You should have arrived here from the super talented Amy Rysavy. For my card today I combined 3 of the new die sets. My focal point is the Ice Skating Girl that I cut out and covered in Glitter. 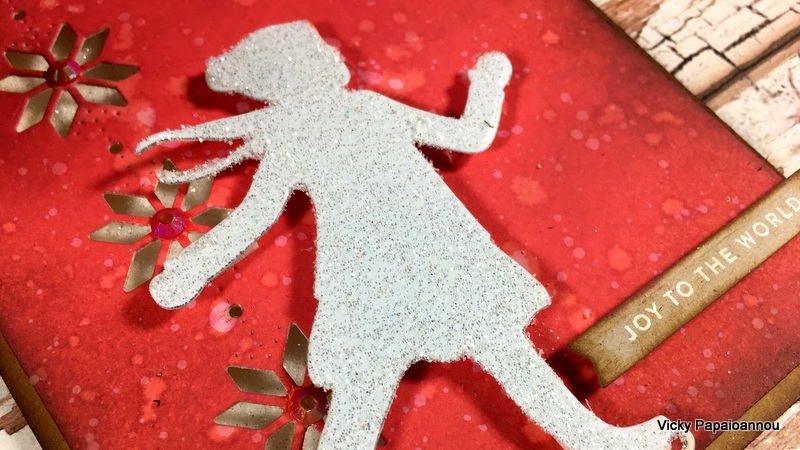 You can also used glitter cardstock instead. For my background I used the Holiday Knit Border to create a lovely design. At the back of the this design I also added glitter paper that shows through the openings. I used my distress oxide inks to add color to my panels and of course I did some water splatters too! The sentiment comes from the Tiny Words Christmas stamp set, that I absolutely love. It’s packed with pretty much any stamp set you will need for the holidays! Finally I used the Nested Banners die set to cut it out. I used the smallest of the fish tail ones. 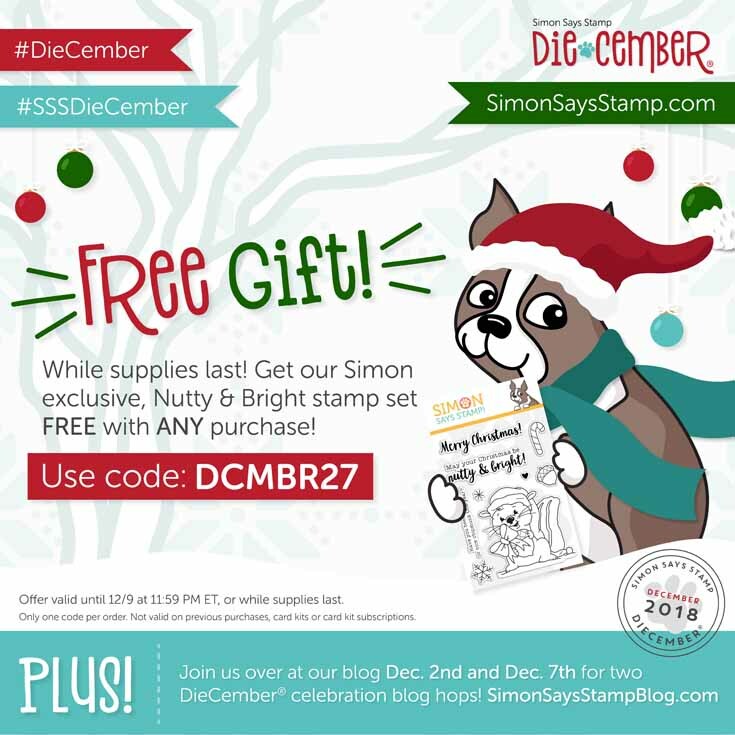 Use the coupon code DCMBR27 to get a free Nutty & Bright stamp set (while supplies last!) with any purchase.The code will expire Sunday, 12/9 at 11:59 pm EST. SimonSaysStamp is giving away a $25 coupon to every stop on the hop from the blog comment section. So leave me a comment below! They will choose the winners over the weekend and post them on Simon Says Stamp store blog on Wednesday, the 12th of December. Make sure to check out there if you won! Such a lovely Christmas card! Such a gorgeous card!! 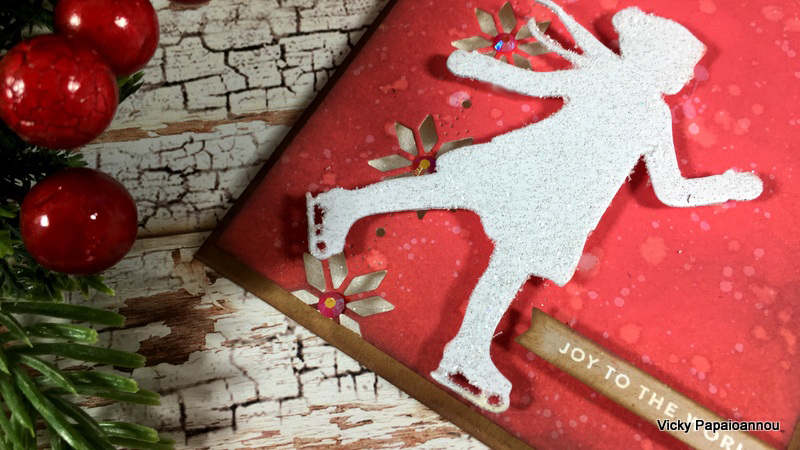 LOVE the distress ink background, the sparkle on the skater and that fabulous border die! That is the prettiest winter card. Not only for the holidays for the whole winter season. Beautiful! I love the feel of this card! The border die and your use of it is perfect. Wonderful card, so festive! Love this new release. Your work is absolutely amazing. I’m blessed that you share your ideas and wonderful video’s of your techniques and ideas. I’ve learned so much from you. I hope you and your family have a wonderful holiday!